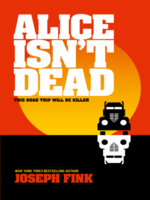 Alice Isn't Dead - RNIB - Supporting Blind and Partially Sighted People. Keisha Lewis mourned the loss of her wife, Alice, who disappeared two years ago. There was a search, there was grief beyond what she thought was possible. There was a funeral. But then Keisha began to see her wife, again and again, in the background of news reports from all over America. Based on the podcast of the same name, Fink’s thrilling first solo novel follows a woman thrown into the middle of a secret war that takes place in the vast, empty stretches of America. Keisha Taylor believed her wife, Alice, dead after she disappeared without a trace. Then, six months after the funeral, Keisha sees Alice in the background of a news report. Thus begins her search, crisscrossing America after getting a job as a long-distance trucker, following up leads culled from Alice’s notes and papers. Along the way, she’s threatened by monsters called Thistle Men and discovers a vast conspiracy that protects them as they prey upon people along the highways. Creator of the popular Welcome to Nightvale podcast, Fink (It Devours! with Jeffrey Cranor) fills his world with fully realized characters, from Keisha, who uses her grief and anxiety to give herself strength, to Sylvia, the runaway teenager who fights against the Thistle Men who killed her mom. Fans of eerie suspense will find much to like. Agent: Jodi Reamer, Writers House.